Simon Franois (Francis) Ravenet, engraver, part of a French family of engravers, active in England and Italy. He trained under Jacques-Philippe Lebas in Paris. Having travelled to London in 1743-44 to engrave two of the plates for William Hogarth s Marriage à la Mode, he settled there; at that time line-engraving in London was dominated by Frenchmen, such as Jean-Baptiste Chatelain and Francis Vivares. Unlike some other successful engravers who were also print-publishers, Ravenet worked entirely for publishers, including Robert Sayer, John Boydell, John Knapton and Paul Knapton; he produced finely engraved views, book illustrations and some portraits. 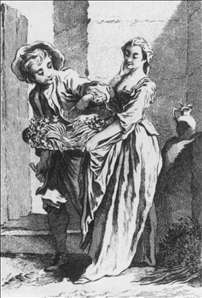 One of his prints, David Garrick and Miss Bellamy as Romeo and Juliet (1753), after Benjamin Wilson, was published by subscription, possibly at the painter s instigation. 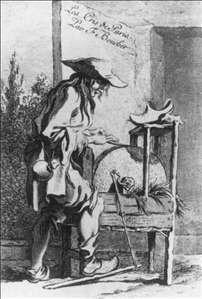 According to Hogarth, Ravenet undertook in 1761 to engrave his Sigismunda; but when Hogarth discovered that Ravenet was under articles to work exclusively for Boydell for three years, he stopped the subscription. Ravenet engraved over 20 large plates for Boydell s series of the most celebrated paintings in England , and also other plates, such as the Triumph of Britannia (1765), after Francis Hayman; he exhibited several of these plates at the Society of Artists (1763-69) but later became one of the first Associate Engravers of the Royal Academy, London. See more details about "The Cries of Paris: Radishes, Turnips"
See more details about "The Cries of Paris: Knife Grinder"